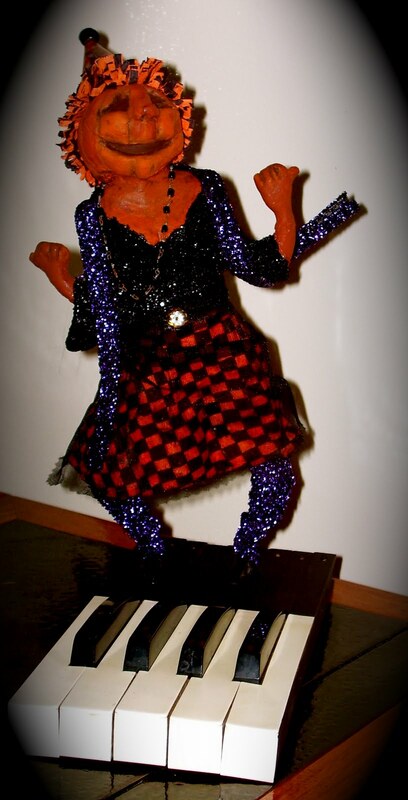 Carey's Quirks is the blog of paper mache artists Kathy & Lori Carey. 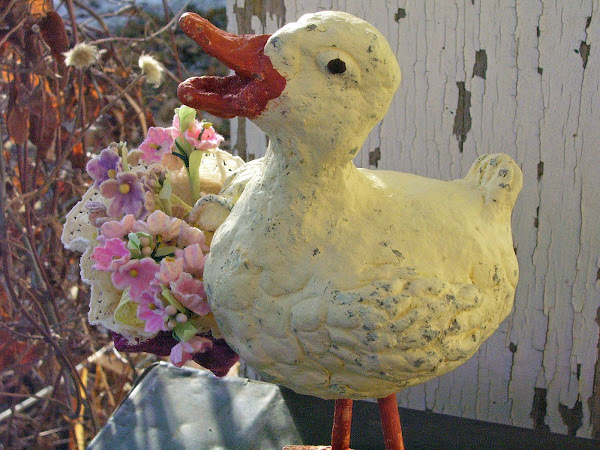 We love to create whimsical paper mache figures using vintage items found from our flea market finds! 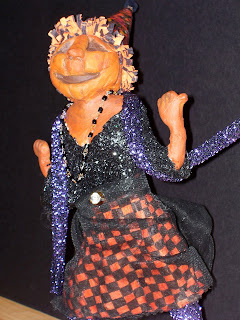 Our favorite holiday is Halloween- we love creating witches and their friends. The Witching Hour Is Coming Upon Us! My fellow Cloth & Clay artist friends have me excited about the next challenge in Art Doll Quarterly. The challenge is to create a shelf sitter. 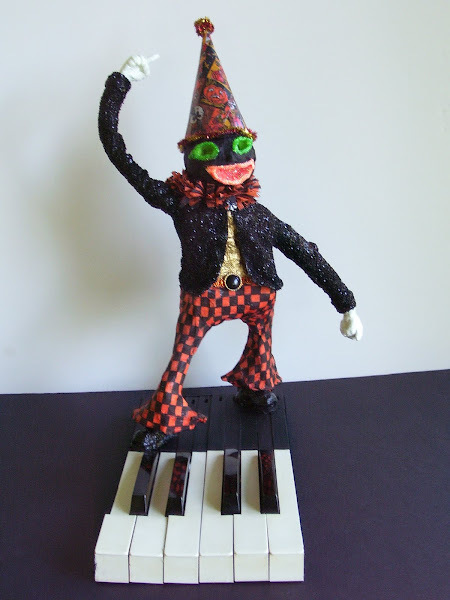 I'm busy conjuring up ideas and materials! I'll post WIP pics soon! New goals and new directions are inspiring and invigorating for me!! I am now returning to my watercolor world. I am currently working on watercolors of my acreage. I love the rural landscape and my goal is to capture my feelings about my Iowa world. I am pleased with my first painting of my kitchen porch. But have been hesitant about its finishing touches! I will still be creating art dolls but primarily just for ART DOLL QUARTERLY magazine challenges and for my own collections!! While I’m still teaching full time, it is hard for me to find the time for creating in 3D and 2D at the same time! I have always loved Andrew Wyeth’s work and hope to share the love of my farm as he was able to share his love of Kuerner’s farm. Another goal of mine is to travel back to Chagrin Falls and relive my childhood memories by painting scenes of my hometown. I will also be returning to the Outer Banks where my family used to vacation each summer. I yearn to paint the sea and cottages. The latch sprung, the bud as it burst? Spring always manages to get there first. These were the words that inspired me when I created my bottle doll Metamorphosis. I wanted to capture the feeling of my fairy emerging from the bottle as a bud opens in the spring. We see the latch sprung on the birdcage as Metamorphosis looks up into the air to view the bird’s flight. Metamorphosis is created from an old pink Key wine bottle. 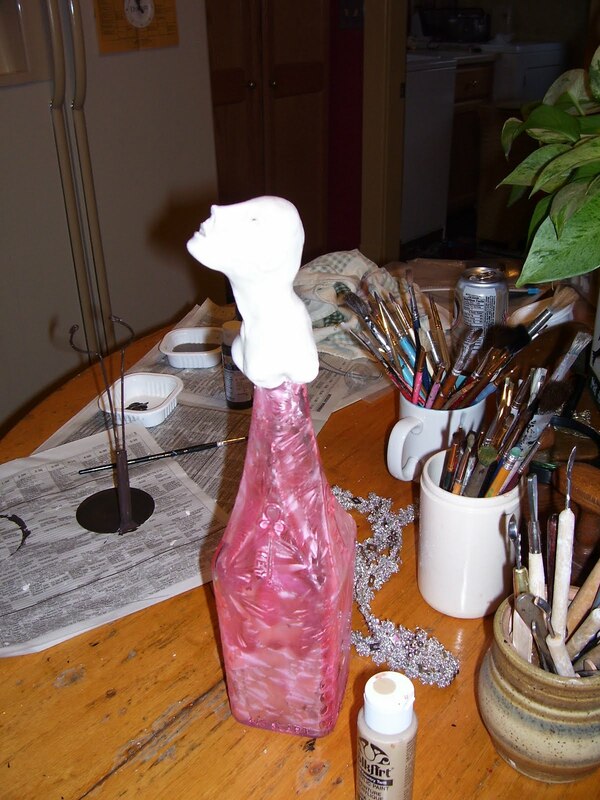 She is created from paper clay which was sculpted directly onto the top of the wine bottle. Her paper clay arms were wired on. Her hair is created from braiding a knitting yarn with a metallic fleck. Her headpiece is created from flowers and netting cut from a woman’s vintage Easter bonnet. Her skirt is fashioned from an old collar. She sits among paper twigs and buds. IDEAS NEEDED! This is where I'm at. I need ideas for what she should hold. I do have ideas for her dress. 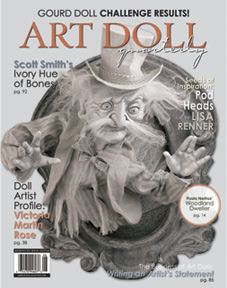 I am delighted to have two pieces in the Autumn issue of Art Doll Quarterly. My Hecate the Gourd Witch is on page 72 and The Boogiewoman (created by Kathy & I together) is on page 115. It's GREAT to have fellow Cloth and Clay Artist Friends Daryle Cook (page 65) and Lorrie Rios' (page 72) artwork in this issue!! I've been asked to record a work while it is in process. I will do my best but I tend to work close to deadlines! I have a piece I am currently working on which I have titled Metamorphosis. It is a fairy emerging from a bottle. My goal is to take photos and post pics as I go along. But we all know how best intentions are! Shadow on shadow, singing sweet and clear. Listen, lovers of wind, the leaves are here! We are pleased to have Blossom receive a little attention! YIKES...you caught me in the process of dressing. The witch's body is added and ready for clothing! She refuses to go in the hen house but would rather roost in the tree outside of the hen house. WE ARE GETTING MORE AND MORE CLUTTERED! The Crows are gathering for Galena! Treasures Are A Waitin' in Galena! Blimey Bearded Bill has been purchased. Many of our pirates were sold in Galena as the Pirates are the High School Mascot! 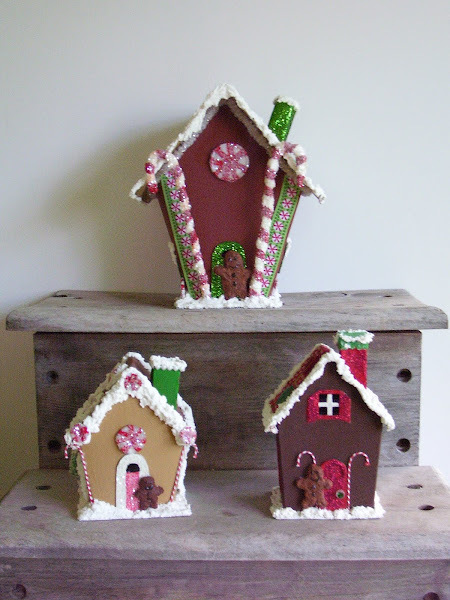 We have been working on a variety of "putz" like houses for a custom order on etsy. We really enjoyed the process. Houses appeared everywhere in the studio! This was created as a tribute to our dearly loved Bassett Hound, Jack who passed away Sept. 2008 of congestive heart failure. Jack, we miss you. The Boogeywoman is featured on page 115 and Hecate The Witch on page 72. My perennial geranium and iris. Hanging on the fence is my quilt made from 1" blocks of my scrap material. Lori's work UNITED WE STAND is featured (page 65). 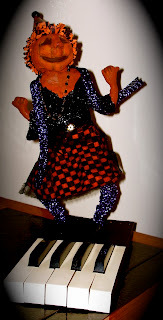 Be sure to see Lori's piece titled UNITED WE STAND in the next upcoming issue of ART DOLL QUARTERLY. As usual, she was running close to the deadline so no pictures were taken! NOTE: The truth is I was so frustrated with working in such a small scale(under 5")that I couldn't wait to put the piece in the mail! 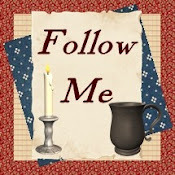 View our LOTTIE & The Witching Hour in this issue's Milieu Challenge. Her life has been an inspiration for my simple country life. Mary Anne enjoys the summer day as she reads a card from a dear friend. Careysquirks is the studio of Kathy and Lori two cousins who love to create! Lori's enjoying the networking with this great group of people! A great group of artists!